Polishing aluminum in eighteen hundred steps. - NGWClub®, Inc.
Polishing aluminum in eighteen hundred steps. Greetings to members of the club. I have been lurking this forum for the past year and thought I could contribute once in a while by writing up a technical paper, or technically writing a paper or something. So here you are. I am restoring/customizing a 78 GL1000. The aluminum valve covers and intake manifolds needed to be cleaned and polished. They were crusty white with oxidation and looked hopeless. I went online and read several accounts of how to clean up aluminum and worked with several of them. After trying several different methods, I have come to the conclusion that the following steps are the best method to a professional look. Many, but not all, aluminum parts have a clear coat applied at the factory or by a restorer. This coating needs to be removed in order to get at the base aluminum. The principle of paint strippers is penetration of the paint film by the molecules of the active ingredient, causing its swelling; this volume increase causes internal strains, which, together with the weakening of the layer's adhesion to the underlying surface, leads to separation of the layer of the paint from the substrate. Apply a generous coating of paint stripper to the part. Using a good quality brush, spread the remover thickly and evenly over the surface. Brush in one direction. Try not to brush over areas that are already covered with paint remover. Check the label of the paint remover to see how long you should leave the remover on the surface, usually about 20 to 30 minutes. Test the condition of the surface by rubbing the blade of a chemical-resistant scraper in a circular motion to see if the paint has been loosened. When removing paint, pour part of the paint remover into a small, wide mouth metal can. A can with a plastic re-sealable lid works especially well. A scouring pad is excellent for removing the clear coat from valleys and inside corners. Plastic cleaning pads can be forced into the tight areas to remove the old clear coat after it has been softened by paint remover. I have found MEK (Methyl Ethyl Death) based gel strippers work the best. Gel based strippers help the chemical adhere to the surface and reduce the evaporation of the solvents, thus prolonging the time the solvent can penetrate the paint. Wash the part with soap and water when finished. Now you have a part without clear coat or paint, and are looking at a part with areas of a white crusty coating. For those who want a rat bike look, skip the remainder of this article, and allow this finish to continue to mature. For others, read on. For immediate removal of oxidation, I found an amazing product quite by accident. I was enjoying a few refreshing adult beverages at a bar-b-que when a friend noticed a bracelet I was wearing. The bracelet is made of several different metals, brass, copper aluminum, steel, etc. I mentioned to her it was bugger to keep polished. She said “just a sec”, went into her house and brought out a small tube of a product called “Flitz metal polish”. She applied a small amount to the bracket, let it sit for a couple of minutes and wiped the polish off. I was blown away. I had never seen metal shine like that! I had tried Brasso, and others, but nothing worked as quickly or effectively as the Flitz. Anyway, sorry for the diversion, Apply a generous coating of the Flitz to your part. Allow the Flitz to sit on the part for a couple of minutes, and then rub the part out with a soft cloth. Rinse with tap water and proceed to the next step. Removing excess oxidation at this step helps keep the oxidation from clogging up the sandpapers and buffing wheels you will use later. BTW, I found the Flitz paste to be stronger than the liquid form. You can find the Flitz by going online and ordering from Flitz.com. A little goes a long way. Now for the “elbow grease” part of the project, that is, sanding. Use 120 grit for any blemishes in the aluminum. If there are none, then skip right ahead to 320 grit wet sand and then 400. You may either hand sand or use an electrical sander for this step. I have noticed a number of articles where people have said to go as high as 2000 grit. That is not needed. In order to get a glass like surface shine, you need to make the surface smooth as glass. Clouding generally occurs for one of two reasons. First, is failure to stop at 400 grit paper. At the most you want to go up to 600 grit but only briefly. The high grit sandpaper creates many tiny scratches making the "mirror surface" an invisibly porous one which means that you can polish until your dremel burns up and you are not going to have a cloudless shine. Reason being, the pores are too small to get all of the crap, that you spent hours getting off, out of the pores. Solution… stop at 400 grit. Let the polishing compounds do the rest (see next step). If you still want to go higher than a 400 after hearing this, then at most use a super fine #0000 Steel wool but briefly. The scratches left behind from the 400 grit will be SMOOTHED out by the compounds instead of scratched out with the sandpaper. Again, wash your part with soap and water to remove any sanding grit left on the part. Load your buffing machine ( Buffing wheel, buffing gun, drill, whatever) with a spiral weave buffing wheel. Load the wheel with Tripoli polishing compound. Tripoli has a rust color to it and can be found at Home Depot. As an alternative I found that green stainless polish compound works quite well too. As you buff the part, there is no need to apply excess pressure, allow the compound to do the work. Continue to buff the part until you can no longer see the sanding scratches. When finished, the part will be covered with a black substance. There are two ways to remove it. Mineral spirits (naphtha) or a rag loaded with white bakers flour. I use the Naphtha as I have a parts washer readily available. At any rate, remove the black gunk and proceed to the next step. Load your buffing machine with a loose section buffing wheel. Apply White Rouge (available at Home Depot) to the wheel and begin buffing your part, again without applying much pressure. The luster and mirror should begin to appear. Again, a black gunk will be all over your part. Remove as per the previous step. Wipe the part with a soft cloth. At this point you may want to set the part on the kitchen counter and walk by it admiringly for the rest of the evening. But wait, there is one more step for those wanting an even finer finish, although, this step may be enough for some. Here is a final step for polish aluminum to a bright mirror finish. Some have recommended using Jeweler’s rouge. Jeweler's rouge is a fancy name for rust. Literally. The color is red because it is made from ferric oxide which is rust. it is definitely very fine rust but, rust just the same. It is great for getting that final mirror shine but, there is an even better and finer polishing compound out there if you want to go one step further. When you finally have a "mirror surface", you don't. If you're a sucker for punishment, go that one last step which is, a nightmare, requires hand rubbing or you'll have a serious mess and, requires rubber gloves. India Ink has carbon in it and it is extremely fine. Use Chamois and India ink and keep rubbing it. When you can't get any further, dilute the ink in half and continue the same process until you can't go any further. Dilute in again one half and repeat the same process. You'll get a mirror unmatched. If you pretty much keep your bike clean, then using the diluted ink every now and then will maintain that mirror for you. This step is for those who want an absolute mirror finish. At first when I read about this, I did not believe it, however, there is actually a NASA technical paper instructing aluminum polishers to use this product as a final mirror buff (no kidding see: http://www.nasatech.com/Briefs/Feb01/GSC14147.html). Now you part has a beautiful finish. You blind other drivers when the sun comes out, women stop and adjust their makeup in the reflection of your aluminum parts, and you just can’t help stopping and admiring your handiwork every couple of minutes. To keep that nice polish job looking good, you can do one of three things: 1. Use your Flitz Metal polish occasional. 2. Rub the finish out with a diluted mixture of India Ink. 3. Place you bike in an airless environment and never touch it again. Wear goggles when polishing. Polish remains airborne and gets into your eyes, where your eyelids go a great job of polishing your eye lenses. Further, pieces of your buffing wheel and metal may fly off the wheel and get in your eyes. Wear a dust mask. The dangers of dangers of inhaling aluminum dust have been linked to Alzheimer's, I think. I don’t remember. Wear gloves. The buffing process and use of chemicals can enter your blood stream through your skin. Take a napkin, dab your finger in some coffee and drip the coffee onto the napkin. Turn the napkin over and observe the penetration of the coffee through the napkin. This is exactly how your skin works with solvents. “nuf said. 9. A few personal notes. Apologies to Mothers metal polish, but my experience shows it does not last, and is not as good of a polish as Flitz. Don’t clear coat the part, as you will soon be going through the steps outlined above when the aluminum begins to corrode under the clear coat. I hope this article has been of use to everyone. I spent a serious amount of time researching the internet, using products, and talking with pro polishers. I apologize in advance of all those I may have plagiarized! There may be better ways out there, and I’d love to hear about them. Be safe and enjoy polishing your heads. Last edited by sunnbobb on Wed Jun 11, 2008 8:31 pm, edited 2 times in total. but when there is nothing left to take away"
Excellent writeup Richard. And a wonderful contribution to the forum. Thanks. I just posted a similar thread but your method is way more thorough. Check out mine here. Great minds think alike but this is just too weird. Thanks again. Great tutorial here. thanks to both you guys for your excellent details & instructions. I'd been wondering recently following my carb rebuild on how to do the caps & intake runners for a "decent" look & low maint. use. the only thing I could remember was reading somewhere that aluminum begins oxidizing in seconds after cleaning or an acid bath and that is why clear coating will trap it if it's not applied immediately. 1986 1200 Aspencade - "Heart of Gold"
I'm starting to rethink my clear coat ... the valve and timing covers still look good after sitting in the shed for the winter. Don't know if and when they'll go oxid. I clear coat immediately after the final hot water scrub so maybe I've dodge that bullet ... I hope. My 'Wing sat outside for years before I got it. I was resigned to dull forks and had pretty much decided to paint them black when someone told me about Mothers Mag & Aluminum Polish. It won't produce the perfect mirror finish Richard is talking about, but for the amount of effort required it does a pretty good job. My forks look at least as good as those on most new bikes and it only took a couple of hours to get them that way and about 1/2 hour every 2 or 3 years since to keep them shiny. to quote johnny cash "one piece at a time"
Why wait until it needs head gaskets? The heads are painted the same aluminum colour as the block so they aren't often polished. If you want to do the rocker covers, you should have them off at least once per year to adjust the valves. Re: Polishing aluminum in eighteen hundred steps. It kinda leaves me hangin' for what happened next.???? Whatever I suggest here should be given ample time for a moderator to delicately correct. I apologize in advance. 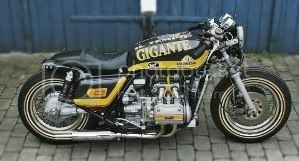 77 WING, 1200 engine with 77 heads, cams, gl1100 foot pegs, Magna V65 front end, 764A carbs, [-gone Suzuki M109 monoshock--, replaced with gl1100 shocks] gl 1200 swing arm, gl1500 final drive, wheel and rear brakes Valkyrie seat, Meanstreak tank, Sportster pipes, Power Arc ignition off crank. Yeah ... what happened to remaining 1,798 steps? Im trying to figure out how you made a bracelet out of a valve cover. I guess your not here about the Alchohol and Tobaco? i know this is an old topic but i was wondering one thing. have you tried using aircraft remover instead of the gel based stripper? if so, was it any different? reason i ask is i already have some aircraft remover, so i thought i would try it before buying some stripper. I also wonder if anybody has ever used aluma-brite aluminum cleaner after removal of the clear coat? I've used this stuff on many aluminum items including valve covers and aluminum wheels in the past with great results. It removes dark stains as well as oxidation and takes very little time. A little polish afterwards can have parts looking new or better. josh.wingo wrote: i know this is an old topic but i was wondering one thing. have you tried using aircraft remover instead of the gel based stripper? if so, was it any different? reason i ask is i already have some aircraft remover, so i thought i would try it before buying some stripper. I've used the aircraft remover to strip my frame - works very well. A caution on aluminum, however - Aircraft Remover contains a lot of ammonia, which can rapidly attack aluminum (this is why you should use caution using Greased Lightning on aluminum). If the part is already oxidized, you should be Ok as long as you don't leave it on for too long. Still, I'd test in a non-conspicuous area first. 1979 CB750F rat bike - the Rocket - FOR SALE!!! !